Well what a fantastic day we had at the Teddies show in London on Sunday 13th Sept. We met some of our UK collector friends, some of whom had travelled a very long way to come to the show. Without wishing to sound big headed, I had some really wonderful comments about my creations, they were really appreciated, thank you. I was so busy I did not get a chance to have a good look around, and more seriously the credit card did not get much use. Thanks to everyone for their support and to those of you who could not make the show, thank you for your patience with the addition of new creations to the web site. 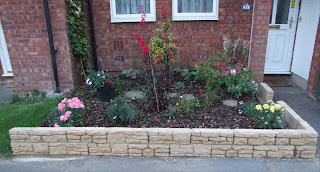 That was Sunday, onto Monday with a bang, we had to do the front garden wall, well Keith did, I just supervised, part of it looks like a dogs hind leg, but it is supposed to look hand built, well I think that is the expression, Only the top bit to go on now. To finish the day we have just watched with the greatest pleasure our favourite musical, this time a film version of Phantom Of The Opera, we have seen the show in London and every time we have been to Las Vegas it has been as must see show, Vegas is unbelievable, our only wish is that we could actually contact Sir Andrew Lloyd Webber just to say thank you for the most amaxing production in the world, perhaps one day we will be able to contact him. If you are visiting Vegas, go and see Phantom, you will love it.